Whether you’re only a little bit Polish or have pierogi running through your veins, one of the most beloved and sacred Polish traditions is the breaking of the opłatek on Christmas Eve, or Wigilia. Practiced for centuries, it represents all the good of Christmas—faith, family and friendship. An opłatek is basically the same bread wafer you have at church, except it’s unconsecrated. Experts believe that the practice of sharing opłatek evolved from an earlier practice in which Poles shared podpłomyk, or thin, flat bread made on fire-heated stones. This meal was common in ancient Slavic societies before Christianity. The opłatek wafer was developed later by the Benedictines of Cluny in Burgundy, France and spread throughout Europe, reaching Poland. Eventually, the practice of sharing the opłatek on Christmas Eve became commonplace and is today practiced within Polish families around the world. Family members, typically starting with the husband and wife, wish each other health, happiness and good fortune. 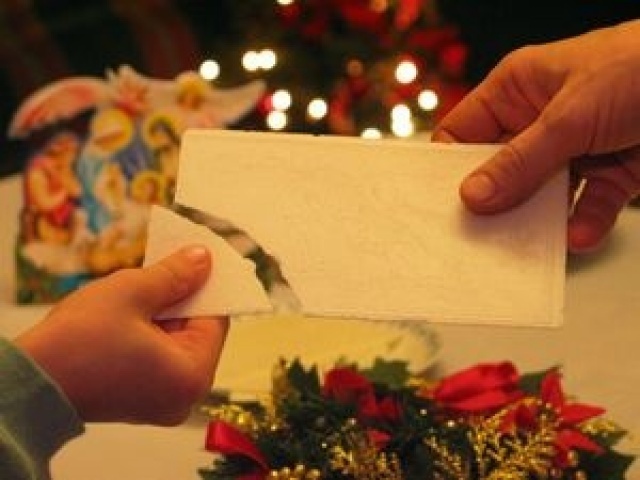 The person receiving the wishes breaks off a piece of opłatek from the person offering them and eats it. Some families do it the opposite way. No matter how they do it, though, the meaning remains the same. It’s a custom that unites the entire family, from the youngest toddler, to the oldest patriarch, in a symbolic display of love and Christmas spirit. Since it’s Christmas Eve today, or Wigilia, I want to symbolically share an opłatek with every person reading this. I wish all of you the best of health in the coming year, as nothing is more important. I wish you success in all of your endeavors, be they acquiring a new job, finishing school, finding that special someone, or comfortably retiring. Finally, I wish that all of you find a little bit of happiness every day of your lives. Reflect upon and be appreciative of everything God has given you, and you will never have a sad moment. Thank you. No Polish Blood, but pierogo runs through my veins as my husbands family are Polish. Slovaks do this too… especially in the rural villages where folks can’t get to the church in winter. Great grandma sent some to Ohio to her daughters after they came to America. We’ve been making Locksha though, a potato dough tortilla baked on the bottom of the oven to go with the Velija Mushroom and Saurkraut soup and 12 ritual dishes of Christmas Eve. It is not the same, brushed with butter and salted, but we love it. I’ve traced my family back to Slovakia to the year 1775. My Irish mother was a wonderful cook, and always created a few of the Slovak dishes such as Halupki. We also always had a bread on Easter that was called Puska (sp). I have never heard of this custom prior to this beginning post, and your comments about Locksha and also Mushroom & Saurkraut Soup is also new to me. I am a Slovak Lutheran and we make oblaky on these old irons that we have. That’s a really fascinating custom. Thanks for sharing it! Thanks so much for sharing. A tradition worth holding on to. Much love and happiness to all. when sharing the oplatek the wish was always—health, wealth and a heavenly crown. This is great. We have done this all our lives and continue to do so on Christmas Eve. I am Slovak and grew up with all of these traditions. My siblings and I still continue the traditions. Witam, a czy Wiecie że opłatek jest w kilku kolorach? tak, tak biały którym sie dzielimy ze swoimi bliskimi natomiast jest czerwony, zielony, żółty którym w Polsce dzieli sie ze zwierzętami teraz już ze wszystkimi ale początek tego był na wsiach gdzie ze swoim inwentarzem dzielili się gospodarze. Pozdrawiam i Życzę zdrowych Radosnych Rodzinnych Świąt Bożego Narodzenia oraz Szczęśliwego Nowego 2015 Roku. Hello, and if you know that the wafer comes in several colors? so, so white we share with their loved ones while it is red, green, yellow which in Poland is divided with animals now with all but the beginning of this was in the countryside where your inventory shared hosts. Best regards and I wish healthy Merry Family Merry Christmas and a Happy New 2015 Year. Hallo, und wenn Sie wissen, dass der Wafer kommt in verschiedenen Farben? so, so weiß man mit ihren Lieben zu teilen, während es ist rot, grün, gelb, der in Polen wird mit den Tieren nun mit allen geteilt, aber der Anfang war dies in dem Land, wo Ihr Inventar gemeinsamen Rechnern. Viele Grüße und ich wünschte, gesunde Frohe Familie frohe Weihnachten und ein frohes neues 2015 Jahr. Dobrý deň, a ak viete, že oblátka je dodávaný v niekoľkých farbách? tak, tak biela zdieľame so svojimi blízkymi aj keď je červená, zelená, žltá, ktoré v Poľsku sa delí so zvieratami teraz so všetkými, ale na začiatku to bolo na vidieku, kde sa vaše inventár zdieľaných počítačoch. S pozdravom a prajem veselé zdravé rodinné Veselé Vianoce a šťastný nový rok 2015. Thank you. My parents & grandparents came from Poland. We have carried out this tradition since I was a child. Wesolych Swiat. I wish Health for you, The best of all will follow. Wigilia is pronounced Vigilia. I am almost 93 and shared it this Christmas Eve at my oldest daughters home with her husband, 2 sons, 5 grandchildren, a friend, youngest daughter and her husband. Fish is the main food and we were lucky to share both salmon and haddock caught by one grandson this past summer in Alaska which he himself cooked. It was the most delicious sea food I have ever tasted. We passed the Oplatak before our extensive dinner with Kielbasa, Pierogi, Golumpki, dried Mushrooms from a Polish Market, many kinds of veggies, homemade bread, etc. Desserts were to your choosing. We always share Oplatek on Christmas Eve, Wigilia…league of nations now…serve an odd number of dishes & an empty plate for a stray traveller too. thank you for carrying on the tradition. I will refer back to it to give it to my son and his family.